When someone screams: ‘Arvind tum Sangharsh karo’, the unspoken part (which again dates back to 2011) is ‘we are with you’. Aam Aadmi Party seems to have taken up a challenge. This is Delhi, 2018. At Chief Minister Arvind Kejriwal’s residence in Civil Lines a crowd has gathered. It is large, restive, pulsing with energy. They stream in as a hot, dusty glaze covers the city. All are in attention, in the moment. When leaders on the podium shoot out a slogan, they respond. Where has Delhi seen this before? The sights are reminiscent of seven years ago, when Kejriwal led India Against Corruption (IAC), a campaign to clean up Delhi politics. IAC or Aam Aadmi Party, this movement/party could always, somehow, mobilize crowds. It could get bedfellows together, even strange ones. This gathering is a signal that that may happen again, but this is politics and, of course, unpredictable. If IAC was populated by PLUs— people like us, the hip, educated and well-off, then its AAP version 3. The first version was seen during the Delhi elections of 2013, then in 2015, and now 2019 looms. Today’s Aam Aadmi Party gathering is populated by a more varied lot. They are the educated but not necessarily the chic. They are youthful but not as young. And there are large numbers of slightly older middle class folks. Here are the older gentlemen volunteers. Here is the crowd from Delhi's outer districts. They are dressed mostly in white. A huge number wear the trademark AAP caps. 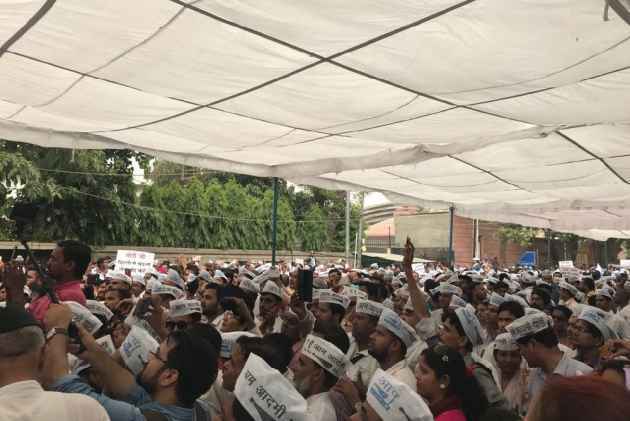 Your white caps look like snow in June, as Dilip Pandey said from the stage. This crowd is full of volunteers and committed cadre. There's less of that slick smoothness and more hunker-down-and-get-together happening here. There are people who can move people in this crowd too. And many who seem to have taken half a day off from offices in government and the private sector to show up. Many more have a mobile phone, being used to stream the event live. Groups, circles and squares of smaller groups form, filling the air with slogans, again echoing Ramlila Maidan. When someone screams: ‘Arvind tum Sangharsh karo’—Arvind, you fight, the unspoken part (which again dates back to 2011) is ‘we are with you’. Aam Aadmi Party seems to have taken up a challenge. Former Finance Minister Yashwant Sinha, who recently broke away from the BJP, made a little speech in solidarity . He said he tried to meet the Lieutenant Governor of Delhi to intervene on behalf of Kejriwal but the L-G, it seemed to him, pretended he wasn’t home. The crowd cheers him. Wednesday’s gathering has been called to march to the Lieutenant Governor Anil Baijal’s residence. Gone is Aam Aadmi Party’s anti-corruption campaign. But leaders on the podium clarify that this is because Delhi was stripped of control over the Anti-Corruption Branch. The government has delivered development—education, electricity, water, mohalla clinics. It wants to do more, deliver services to doorsteps—but the L-G has blocked them. The long drawn out wait for the Supreme Court to rule on Delhi’s statehood brought this event together. To make the point that this delay has been unfair to them, AAP leaders compare the L-G with a ruler of Delhi: king-like but unjust. Singh says ‘LG-Modi wapas jaao’—‘L-G, go back’. And the response is: ‘wapas jaao, wapas jaao.’ This is AAP’s way of putting the central government, courts and L-G on the back foot vis-à-vis its demand for full statehood. Kejriwal is already on strike at the L-G’s residence. Top AAP leaders, transport minister Satyendra Jain and Sisodia are on hunger strike. This is going to be interesting.